"I have said that there stood in the early Middle Ages, and perhaps earlier still, a persistent conception of London as a distant counterweight to Rome, the capital of all Christendom. 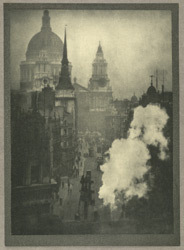 This conception found expression, not only in the dedication, but in the character of Old St. Paul's, for when the rovolution of the human mind in the century of the Crusades - which was marked by so many triumphant changes - stamped Europe with the Gothic, the Gothic cathedral which replaced that of Ethelred was designed to exceed, in size at least, anything else of its kind in Europe. Its spire was higher than any other then standing; in length it surpassed every other metropolitan church, and the curious can still note upon the floor of St. Peter's at Rome, the mark showing the length of Old St. Paul's and proving it to surpass in magnitude any of its rivals. It was a building characteristically English, depending for the effect of vastness upon its length, upon its spire for an external effect of height, with the square east end of English Gothic, and the Great English perpendicular light occupying that east end at the end of the Middle Ages."